At the core of successful financial management is a knowledge of budgeting. A budget is a financial plan stated in numbers. There are three types of budgets: operating budgets, cash budgets, and capital budgets. 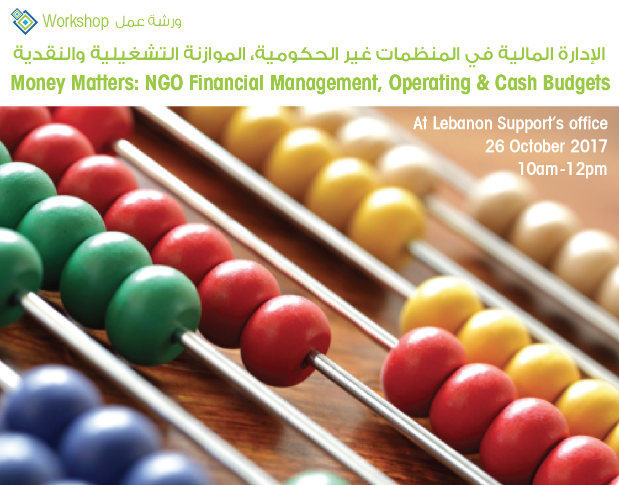 In this session, the trainer will talk about the key aspects of operating and cash budgets. This open workshop is free of charge. This workshop was developed as part of a greater curriculum in partnership with ACTED and funded by the EU. Pateel Papazian is a financial trainer and consultant with over 19 years of experience in public accounting and financial management. For nine years, she was a Director at KPMG - Lebanon, where she was in charge of conducting audits and managed the ‘Train the Trainers’ program. In 2008, Pateel moved to the NGO sector as the Chief Financial Officer (CFO) of one of the leading microfinance institutions in Lebanon. In October 2010, she joined the American University of Beirut (AUB) as Director of Financial Reporting and Compliance, a position she held for 2 years before becoming a full-time consultant. Pateel’s curriculum as a financial trainer includes seminars on IFRS, USGAAP, IPSAS, Financial Statements Analysis, Budgeting & Cost Control and Auditing & Internal control. Additionally, Pateel delivers two US training programs in the Middle East, CNAP (Certified Nonprofit Accounting Professional) and PWBC (Proposal Writing Boot Camp). Pateel Papazian is a Certified Public Accountant from the state of California and holds an EMBA degree from the American University of Beirut. *The Civil Society Incubator was officially launched by Lebanon Support in 2016 and aims to provide tailored support and mentorship to civil society actors, based on the needs of the partner. The Incubator is designed to foster the creation, development, and growth of local civil society and public action initiatives, organisations, or projects. Incubation at Lebanon Support is done through an array of services such as provision of office space, coaching and mentoring on technical issues, management, administrative matters, research, advocacy, networking, and web development among others. يكمن نجاح الإدارة المالية في معرفة الميزانية بشكل جيّد. الموازنة هي خطة مالية مطروحة بالأرقام. هناك ثلاث أنواع من الموازنات: موازنة تشغيلية، موازنة نقدية، وموازنة رأسمالية. ستقدم المدربة خلال هذه الورشة العناصر الأساسية للموازنات التشغيلية والنقدية. هذا التدريب متوفر للجميع مجاناً. باتيل بابازيان: مستشارة ومدربة مالية لديها خبرة تزيد عن 19 عاماً في المحاسبة والإدارة المالية. • تاريخ: نهار الخميس 26 تشرين الأول ٢٠١٧، من الساعة العاشرة حتى الساعة الثانية عشر ظهراً. تأتي ورشة العمل هذه ضمن مشروع بالشراكة مع ACTED - أكتد وممول من الاتحاد الأوروبي. *أطلق مركز دعم لبنان برنامج Civil Society Incubator(الحاضنة للمجتمع المدني) رسمياً في 2016 ويهدف إلى تطوير قدرات الفاعلين في المجتمع المدني وتقديم الدعم والمتابعة حسب الحاجات. هذا البرنامج مصمم لتعزيز خلق وتطوير ودعم استمرارية الفاعلين المحليين في المجتمع المدني والشأن العام ومشاريعهم. تتم الحضانة في مركز دعم لبنان عبر العديد من الخدمات، منها تقديم التدريبات والإرشادات المطلوبة في الأمور التقنية والإدارية، إضافةً إلى الأبحاث، المناصرة، الاتصالات أو تطوير المواقع الالكترونية.